Click here to hear Dr. Dunlap's sermon on Gensis 22, When Love Demands Proof, or browse more than 160 recordings of his beloved sermons at his new ministry website, Preaching the Word Around the World with Dr. Reg Dunlap. Try this week's featured sermon, and subscribe to our podcast. SermonSeeker.Com is an online sermon resource sponsored by Dr. Reg Dunlap's RFD International Ministries for Pastors and Christian workers in the preparation of dynamic, expository messages. We currently have 687 sermons online, with more being added monthly. You can preview sermons for free, and the complete text is available for immediate download. Prices are $15.00 for 5 or $69.95 for 52 through the expository preaching program. Free samples are also available. 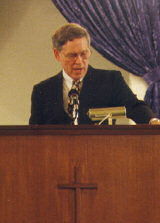 Dr. Dunlap is one of the most popular contributors of sermons on the Internet. For the many busy Pastors who desire excellent expositional, analytical, alliterated, word for word sermons, an Expository Preaching Program subscription is for you. These Biblically-based sermons will greatly enhance your preaching and teaching ministry. Please be sure to check out the free samples. “I joined the 5 sermons for $15.00. I would like to purchase a copy of the CD that you mentioned. I really admire the quality of your sermons.